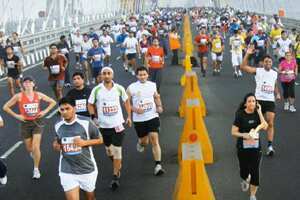 If I have to pick one single event that has changed the fitness scene in India, it has to be the Mumbai Marathon, which was first organized in 2004. Since then the number of people seen walking, if not running, in parks every morning has increased tremendously. Running is the only sport where fans get to participate at a competitive level rather than remain passive spectators. And I believe it’s one sport that can make nations fitter. While the findings of the study—that participation in endurance events induced cardiac damage confined to the right ventricle in the athletes studied—may be true and well-intentioned, the news reports on it were enough ammunition for ill-informed advocates of the “running is bad for you" point of view—among them, medical professionals. People who read such kind of medical research tend not to look beyond the headline and key points. The same researchers also mentioned that the damage reported was temporary and the study was too small to assess clinical outcomes. The researchers also have another disclaimer, that their findings should not be taken to mean that endurance exercise is unhealthy (it comes in too late and has been ignored by most publications reporting this story). Because of this kind of reportage, and also because people do not delve deeper into research reports, sports like the marathon suffer. As is the case with any activity, whether you should do it or not differs from one individual to the other. Your body type and fitness levels determine which activity you should take up and how you should go about upscaling your efforts. The best persons to consult can be your family physician and a qualified personal trainer. Also ask yourself the bigger question: How do the disadvantages of physical exercise weigh against physical inactivity? Way back in 2006, in a panel discussion organized by Medscape, a Web resource for physicians and other health professionals, on “Exercise in the Age of Evidence-Based Medicine", Paul Thompson, director, division of cardiology, Hartford Hospital, Connecticut, US, summed up the issue: “I don’t want any comments about the risks of exercise to be an impediment to physicians recommending exercise for their patients because of numerous benefits." He added: “Exercising is like investing in the stock market: You’re looking for a long-term gain." Point being, if you have picked up running, it’s the best gift you could have given yourself. Keep at it. Let your loved one pick it up as well. Don’t discourage anyone or lose heart when you read such reports. The important thing is to find out from your doctor and trainer if you are fit enough to pick up this activity. Also, if you have been inactive for a long time, do not suddenly go all out and try to achieve the impossible. Take your time and get your body used to a certain pace before you raise the bar. That way you will avoid injury. Over the next month or so, we’ll come up with a series of articles about running, explaining why you should do it, how to enjoy the experience, what can help you perform to your optimum level, and how not to get injured while you are at it. Rajat Chauhan is an ultra marathon runner and a practitioner of sports and exercise medicine and musculoskeletal medicine, and CEO of Back 2 Fitness.